There was a time when triple log, sporty pontoons that could do 30 or 40 mph were a rare thing. It was only a few short years ago, however now they are all the rage. Word is spreading faster than ever that triple log pontoons are the way to go. Starcraft Marine out of New Paris, Indiana has caught onto this word and they’ve responded with a new series in their line up that’s dedicated just to sporty, triple log pontoons - the SLS. I was able to get my hands on a 2017 Starcraft SLS 5. The thing about pontoons is that the sky's the limit when it comes to layout options because of the flat deck. That can be a problem when narrowing down what you like. The SLS line simplifies this as there is a 23 and 25-footer in the lineup and they’re only available in one layout. With a length of 26-feet, 10-inches the SLS 5 is a sizeable pontoon. It of course carries the standard 8-foot, 6-inch beam and because of these numbers it has a person capacity of 14 people. The seating configuration on the SLS is facing loungers in the bow, twin captain’s chairs mid ship and facing loungers in the stern. It’s an open design that allows flow from bow to stern with center gates at both ends. The trim package on the SLS is the middle of the road as it’s nicer than the base trim but not luxury like their higher end boats. That’s for a purpose, to create some separation between the lower and higher end boats. Additionally the buyer of the SLS isn’t as concerned about nice vinyls as much as they are about what kind MPH they can get with a 300-hp. 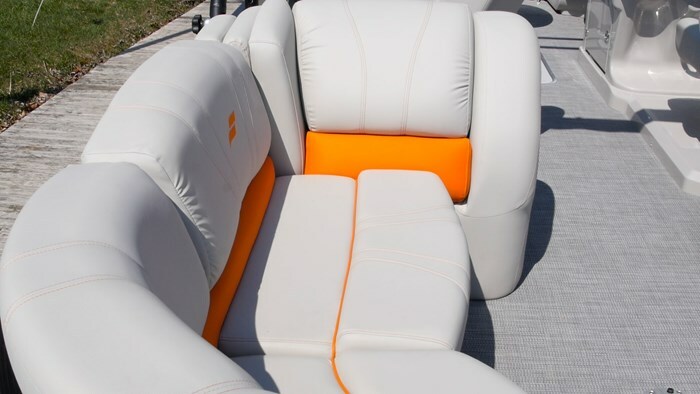 New for 2017, the upholstery in the SLS has received some love as it has been given a bold new look with vibrant orange accent cushions, stitching and Starcraft ‘S’ logo. Starcraft realized that the SLS is one of their best selling pontoons, for good reason, and that it’s time to give it its own identity and to step into the limelight. 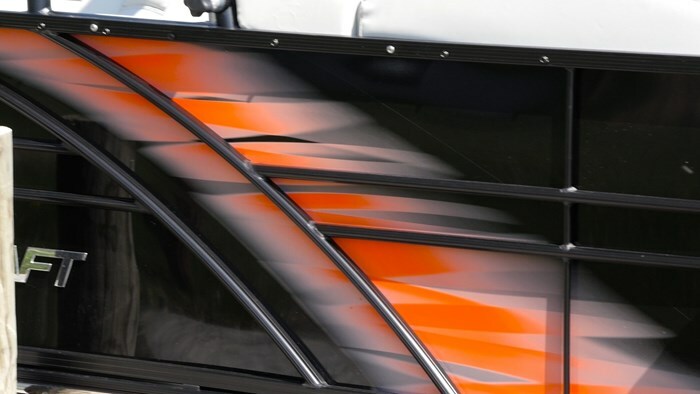 This is complimented by a sport Orange graphic on the outside of boat as well. It’s a bold colour choice but the SLS 5 is a bold boat. It’s geared towards the younger buyer. Towards the guy who is thinking between a bowrider and deck boat and knows he will have a lot of guests in the boat. He wants to go fast and have excellent handling. The SLS 5 has all of these things, but more on that later! The SLS’ layout is conducive to bringing many guests aboard. Under all of the seats you will find storage if you lift the seats up and towards you. Stow life jackets, towels, lines and fenders. The seat bases are a rotocast material and they feature a rain channel in the top of them. So say you forget to cover up your boat and it rains, the water will drip into the seams between the cushions and fall into the channel and drain into the bilge, rather than into the storage itself. This keeps your gear fresh and free of mould. 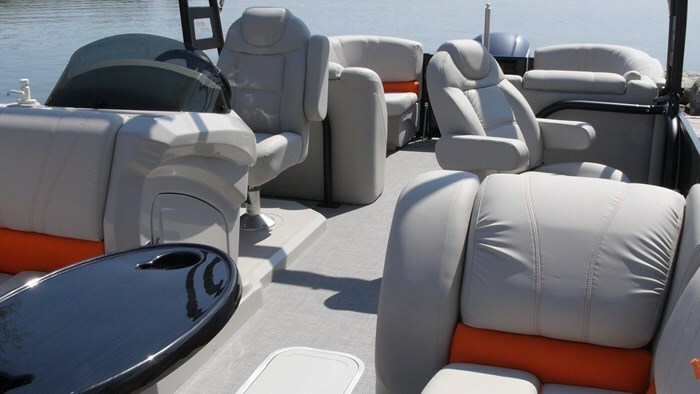 This is something you will find in all Starcraft Pontoons, from the high end to the low. Storage continues in the raised fibreglass helm stand along with in the optional in floor ski locker. The ski locker is a must have option in my opinion. The storage space down there is surprisingly large and increases the amount of gear you can have on board before you start tripping over it. One of the most common questions I hear about pontoons at boat shows is “where is the bathroom?” Well the SLS 5 doesn’t have a dedicated bathroom, but there is a flip up change room. This flips up and folds open in two easy steps so you can change into or out of your swim suits. Now there is a slot in this compartment where a porta potti can easily slide into and fit while the compartment is shut. Not an ideal situation but when you gotta go - you gotta go! As I have said before, this is a sport boat, so watersports is an absolute must for this boat. The rear deck on the SLS 5 is large enough for you to stage wakeboarding or inflate a tube. That or you can just hang out with your toes in the water and listen to tunes as the model I tested had the optional rear facing speakers and stereo remote. There is a ski pylon for waterskiing and a wakeboard tower for wakeboarding. The tower had a very cool plexi-glass Starcraft ‘S’ that lit up with LED. This complemented the LED underdeck lighting that makes the boat just pop when the sun goes down. Another standard feature on the SLS line up is Starcraft’s HMX performance package. This features triple pontoons, lifting strakes, underskinning and an increased fuel tank, to name a few. 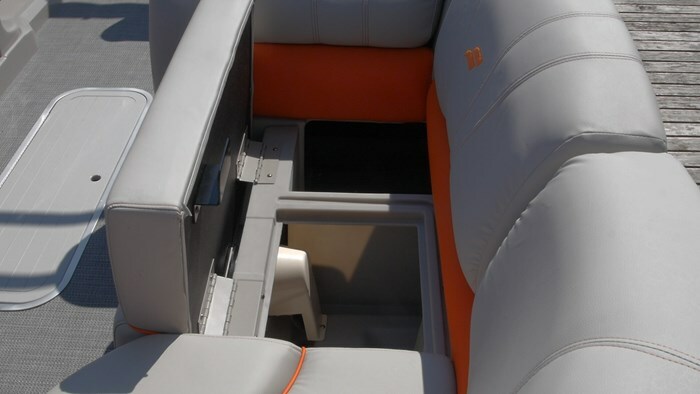 The triple pontoons increases the buoyancy of the boat, allowing it to handle higher horsepower. The lifting strakes do exactly that, they add positive resistance that gets the boat up and out of the water, reducing drag and giving you a higher top speed. The underskin stops water from splashing up against the hat channel cross members of the deck which also causes drag. I have tested many Starcrafts and tested the first boat with HMX on it. They used to put lifting strakes on the outside of the outer pontoons, but found out it negatively affect handling. Since removing them the HMX turns as well as any sport boat and better than most pontoons. People often don’t believe me when I say this so what you really have to do is get out there and see for yourself. But this increased handling is perfect for returning to a downed skier, fun for tubing or simply avoiding hazards that pop up in your path. Cruising in the SLS 5 is heavenly. 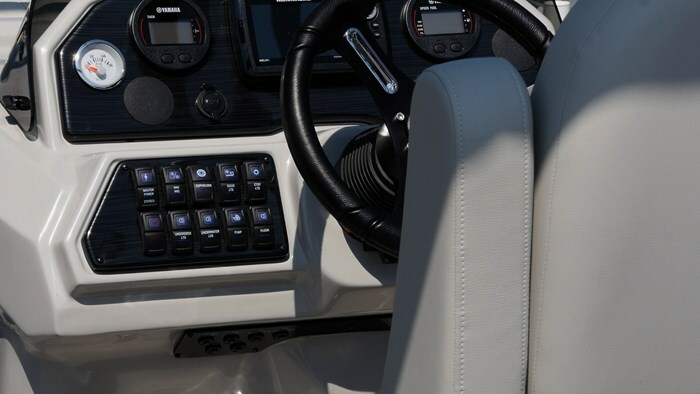 The 26 foot pontoons glide across both calm and rough water alike and the Yamaha F300 V6 outboard is quiet and complementing to the overall ride. Speeds in the 30’s are easily achieved and 40+mph is a breeze. 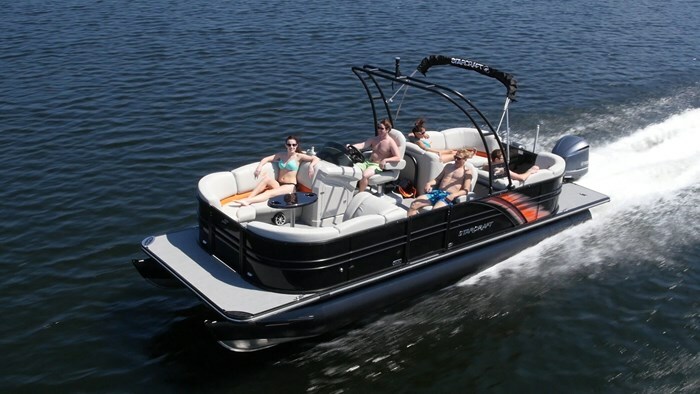 It’s a pontoon that can compete with any bowrider out on the market. I feel like some people still think of “pontoon” as a dirty word. But it’s time to change that thinking. Get out of the dark ages and open yourself up to the idea of a pontoon. 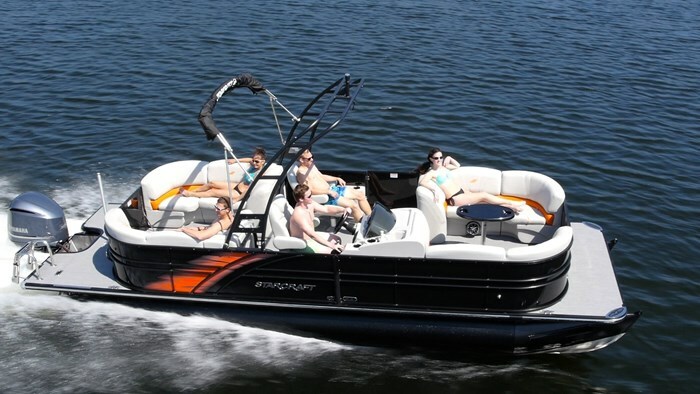 Sure the Starcraft SLS 5 may not be the one for you, but if you’re into sporty handling, fast speeds and vibrant graphics and want to bring all of your friends with you, then you’ve found the right boat!